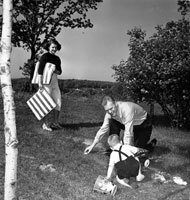 Description: Betty joins husband Jerry (then a young Congresssman) and son Michael for some play in the yard outside their apartment at 1521 Mount Eagle Place, Alexandria, Virginia. 1952. 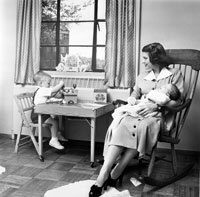 Description: Betty holds second son Jack Ford while eldest son Michael plays a t a small table in their apartment at 1521 Mount Eagle Place, Alexandria, Virginia. 1952. 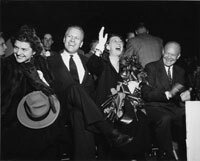 Description: Congressman Gerald Ford and wife Betty attend a Grand Rapids campaign event with presidential candidate Dwight D. Eisenhower and his wife Mamie. October 1, 1952. 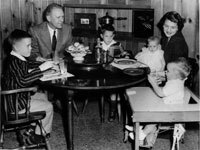 Description: Congressman Gerald Ford, wife Betty and their children Mike, Jack, Susan, and Steve sit in the dining room of their home at 514 Crown View Drive, Alexandria, Virginia. 1958. 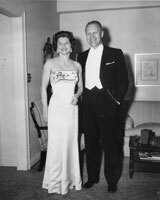 Description: Congressman Gerald Ford and wife Betty dressed for a White House reception. April 18, 1961. 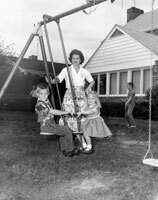 Description: Betty watches as her children Steve and Susan ride on a glider in the back yard of their home at 514 Crown View Drive, Alexandria, Virginia. Her son Michael appears in the background. 1962. 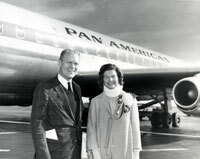 Description: Congressman Gerald Ford and wife Betty pose for a photograph at an unidentified airport. Mrs. Ford was wearing a neck brace for pain. 1964. Description: Gerald R. Ford and Betty Ford talk while Mr. Ford tries some deep-sea fishing during a vacation trip to Free Town, Eleutheria, Bahamas, with other Republican Congressmen and their wives. April 1966. Description: President and Mrs. Richard Nixon with Gerald and Betty Ford in the Blue Room of the White House following Representative Ford's nomination to succeed Spiro T. Agnew as Vice President. October 12, 1973. Description: Gerald Ford takes the oath of office as Vice President, in a ceremony administered by Chief Justice Warren Burger and witnessed by Betty Ford, President Richard Nixon and a joint session of Congress. December 6, 1973.